There are definite advantages from convoying behind big-rigs on long drives — and not just the fuel savings. If this new networked-vehicle system comes to fruition, riding behind Smokey will also enable your car to drive itself. 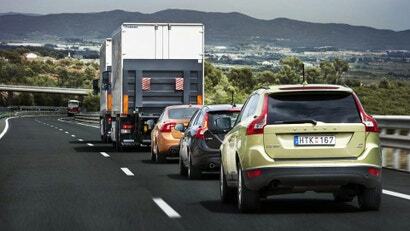 The SARTRE (Safe Road Trains for the Environment) project by Volvo, which has been in the works since 2009, aims to wirelessly link vehicles together and tether them to leading trucks, creating a self-driving convey of vehicles. Networking them together allows each vehicle in the line to autonomously match the acceleration, braking, and turns of the truck — essentially a computerized game of follow-the-leader. 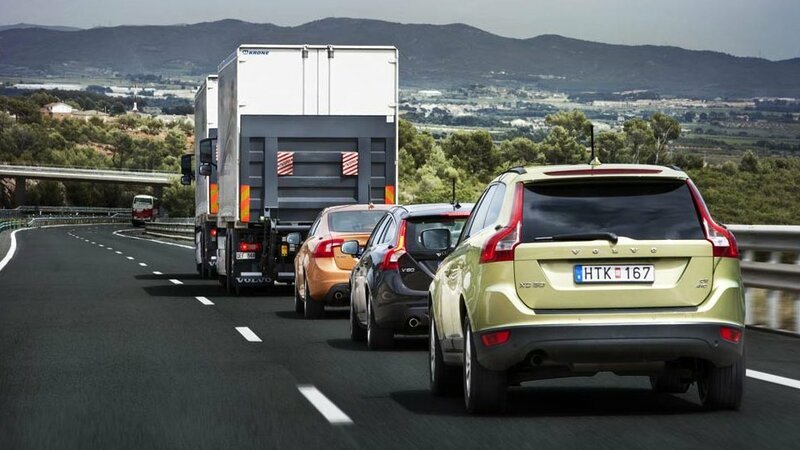 A recent system test saw a Volvo XC60, a Volvo V60, and a Volvo S60 to a lead truck and sent the steel conga line on a 124-mile joy ride on a Spanish public highway at 53 mph. "Apart from the software developed as part of the project, it is really only the wireless network installed between the cars that set them apart from other cars available in showrooms today," Linda Wahlstrom, SARTRE's project manager told Live Science.